I first heard the Star Spangled Banner at a July 4 community barbeque many years ago. Fresh from my homeland just two days previously, I stood in small town America and watched, and listened, as everybody joined to sing this anthem. (And yes – that was my first exposure to that great American institution: barbeques! )To this day, whenever I hear this, I remember that first July 4 and am reminded of the amazing display of patriotism, unity. Those were the days when America was torn apart by the Vietnam war, when neighbour argued with neighbour over the back fence about the validity of the US involvement in a land far away. But, at that barbque, celebrating a most American holiday, there was no evidence of the tears in the fabric of American society. For those few shining moments, there was a unity, a common bond of purpose. Many years have passed since that first time. I have travelled many miles of the heart, and learned many things – worked with thousands of children from around the world in both America and Canada. You have to know that I was raised with a visceral love of my country. 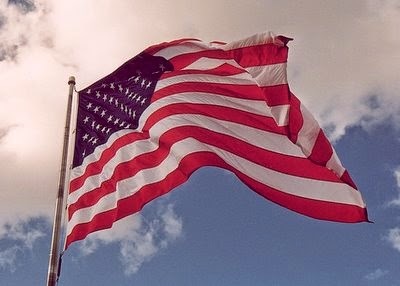 To this day I get goosebumps whenever I hear MY national anthem, no matter the miles separating me from my homeland. I can sing every word, and taste, and feel, and smell the land of my birth. A really interesting history of the origins of the Pledge of Allegiance here. Clavell asked his daughter what that all meant after she had finished. She had no clue. Imagine that. Clavell then wrote a short story (by his prolific standards anyway. lol) called “The Children’s Story.” You can find the text of the whole story online – I did. Please, go read that here. I came across a copy of this a few years back, and I remember how it resonated for me. At the time, I had worked with many kids, was a mother myself, and was currently working in a classroom of impressionable 5 year olds. Is there anything more precious? That may sound like a throwaway comment, question, but it really is not. I explained the background of the anthem and then sang all four stanzas. Let me tell you, those people had never heard it before — or had never really listened. There was a standing ovation. But it was not for me; it was the anthem. At first, our seamen proved better than the British. After we won a battle on Lake Erie in 1813, the American commander, Oliver Hazard Perry, sent the message, “We have met the enemy and they are ours.” However, the weight of the British navy beat down our ships eventually. New England, hard-hit by a tightening blockade, threatened secession. The British reached the American coast, and on August 24, 1814, took Washington, D.C.Then they moved up the Chesapeake Bay toward Baltimore. On September 12, they arrived and found 1,000 men in Fort McHenry, whose guns controlled the harbor. If the British wished to take Baltimore, they would have to take the fort. After it was all finished, Key wrote a four stanza poem telling the events of the night. Entitled “The Defense of Fort McHenry,” it was published in newspapers and swept the nation. Someone noted that the words fit an old English tune called, “To Anacreon in Heaven” — a difficult melody with an uncomfortably large vocal range. For obvious reasons, Key’s work became known as “The Star Spangled Banner,” and in 1931 Congress declared it the official anthem of the United States. The first stanza asks a question. Where the foe’s haughty host in dread silence reposes, What is that which the breeze, o’er the towering steep. That the havoc of war…and the battle’s confusion. I hope this will help you to look at the national anthem with new eyes. Listen to it, the next time you have a chance, with new ears. Pay attention to the words. And don’t let them ever take it away … not even one word of it. So back to my question: Is there anything more precious than young children earnestly reciting the words on which your country was founded. My answer? Yes – there sure is. More precious than the recitation, is the teaching ALL our children what love of country means. Concepts like loyalty, honour and duty to one’s country seem to be in short supply in some schools these days. But I suggest to you that it is critical today, that we each read, re-read words like this, and the Pledge of Allegiance. Not just read, or mouth the words, but really understand, feel and taste the importance of what our founding fathers gave us. Now it is imperative that we stand firm at the gates. Now – as parents, educators of the precious young minds we are charged with moulding, it is vital that we instil in every child what ‘country’ means. Today, just as throughout our history, we must remind ourselves what we stand to lose if we are negligent in OUR duty. We dare not abdicate our responsibility for our young ones. We MUST teach our children well.